E is for Explore! : Stacked! 1. M, M, M, R - Learn about mean, median, mode, and range through a stacking competition, no nesting cups allowed! Teams of two race to stack as many cups as they can in one minute. When time is up, kids count how many cups they stacked. Write down their numbers on the board from lowest to highest score. First, find the mean, add up all their scores and divide the sum by how many teams there were. Next, circle the number that falls in the middle - median. Mode - did anyone stack the same number of cups? Which number is repeated more often than the others (the most popular score). Finally, find the range: subtract the lowest score from the highest. 2. 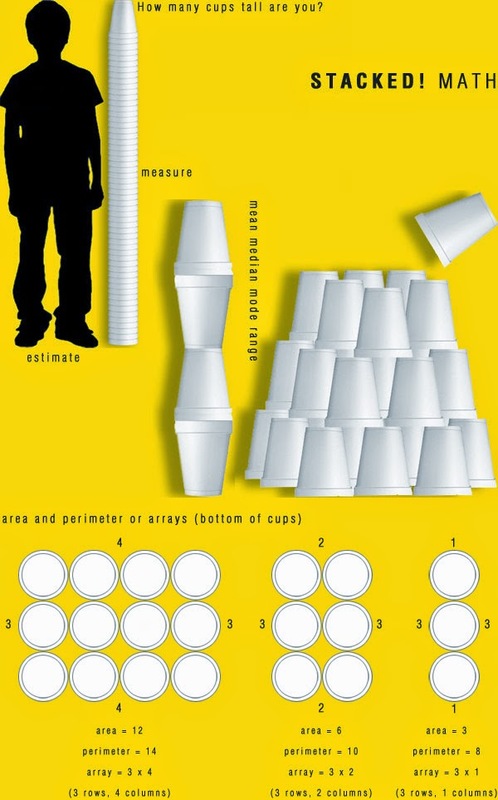 Measure - For younger kids, you can have them race to stack cups for a measuring competition! Pair kids up into teams of two. Teams stack as many cups as they can in one minute, no nesting cups allowed! Have them measure their stacked sculpture (height and width). What team will have the tallest castle? Who's will be the widest? Count the cups, what team stacked the most in one minute. Did any teams get the same score? 3. Estimate - have kids estimate how many nested cups it will take to build a tower the same height as them. 4. Revolving Math - Click here for place value and greater than, less than, or equal to cups! This is a fantastic idea!! I am sure that it would get kids engaged. Thanks for sharing.